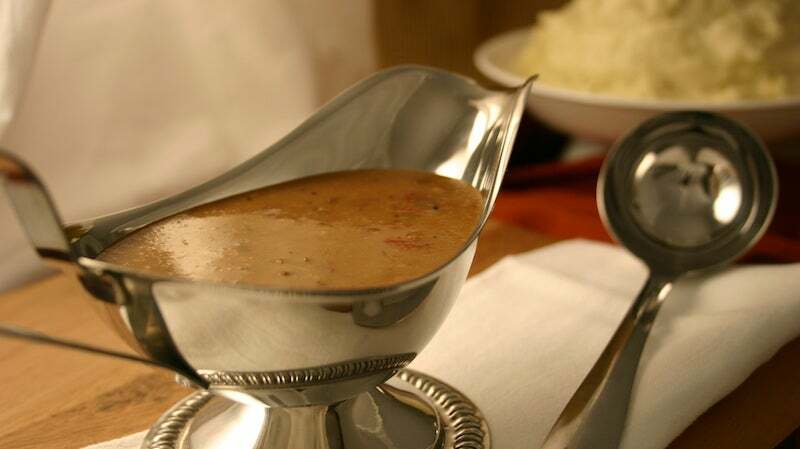 Gravy isn't the hardest dish to make, but if yours turned out a bit watery, it won't be the topping your potatoes and turkey need. Here's how to fix it, whether you have 30 minutes or one before it hits the table. If you have 30 minutes…Brown another roux and whisk your too-thin gravy into that. About 1 Tbsp. each butter and flour will thicken 1 cup stock. If you have 10 minutes…Work 2 Tbsp. room-temperature butter into an equal volume of flour in a separate bowl until it forms a smooth paste. Whisk into the gravy a bit at a time, letting the gravy gently boil between additions, until thickened to your liking. If you have 1 minute…Mix 1 Tbsp. each cornstarch and water to form a smooth liquid. Whisk into gravy and let boil a few seconds to activate the starch. Repeat as needed. If you have longer than 30-minutes until your gravy needs to be on the table, simmer it over medium heat so your thin gravy reduces and thickens up all by itself.